It is officially harvest time and officially fall and I am officially so excited about it that I’m about to explode. This is high gear food preservation season for me. I have an ant-and-grasshopper parable complex and I start flying around stuffing things maniacally into jars. My benchmark -and you may have heard me mention it before- is “Would I love to eat this in the middle of winter?” If the answer is yes, I figure out a way to preserve it. Since freezer space is at a premium (I’m saving room for the venison that I’m hoping will fill it), I rely on canning to hang onto that harvest freshness year ’round. I’ve had to scale back my canning efforts this year due to a busy summer schedule, but this has been a good thing. I’ve had to focus on what we really want to eat, what we want to give as gifts, and what makes me weepy-happy to have on the shelves. Among those are home canned pears. Not just any pears, mind you, but my favourite ginger pears in dark syrup. Home canned pears are -on their own- some of the best things on earth: tender, sweet, and full of pear-y goodness. When you add just a smidge of the warming power of ginger to those pears, they absolutely sing. Hang on. I need to channel my best internal infomercial hawker. But wait… There’s MORE. Not only is this one of my favourite things to eat, it’s one of my favourite kinds of recipes; it’s a three-fer! Three recipes for the price of one! How is this even possible? Oh gosh. It’s so easy, it’s almost criminal. You know how light fleshed fruits brown when cut unless they’re treated with lemon juice, fruit fresh, citric acid solution or somesuch? That little lemony bath that prevents your pears from becoming ugly and brown does double duty. After all the pears soak in it, you leave just a couple in the drink and boil it, then strain. Ta da! A delicate, mild pear juice with a bit of body. And the pears you soaked? You warm them and then pack them in a dark ginger syrup (courtesy of raw or brown sugar) that has been steeping some finely sliced ginger. You pack the extra syrup -because there WILL be some- into other jars and Vi-Oh-Lee! You have pear juice, ginger pears in dark syrup, and ginger pear syrup. Let’s examine the possibilities, because they’re numerous! Aside from eating the pears straight from the jar, you can bake them in a crisp, eat them on vanilla or pumpkin ice cream, serve with roasted pork, toss into smoothies or winter fruit salad. Yes, you can drink the pear juice as is, but it’s wonderful in party punch or hot toddies, and since it is sweet enough without added sugar, it’s wonderful for the kiddies. “Dark ginger pear syrup?” you say. “What do I do with THAT?” Oh people. Oh my. 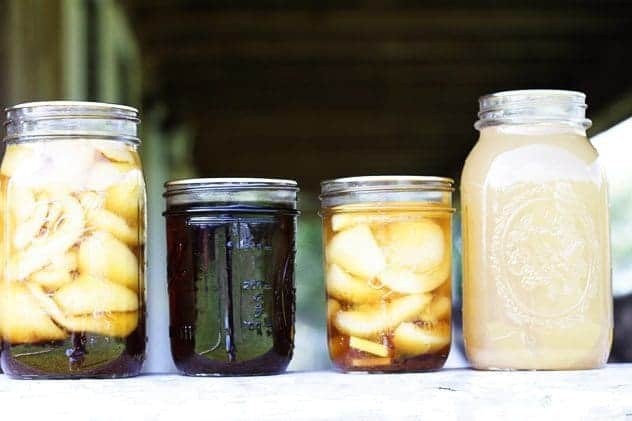 You drizzle that on ice cream, over apple pie, add a tablespoon or two in apple or pear crisp, use it in mixed drinks, or pour a little over ice then top off with seltzer for -wait for it- GINGER PEAR SODA. Holy moly. Cut the pear in half. Seriously. Start here before you peel it. Use a vegetable peeler -not a paring knife- to peel the pear. That way you only pull away the skin and don’t lose any precious pear flesh. Use the small end of a melon baller to remove the tough core at the base of the pear. Use the larger end of the melon baller to remove the seed area from the pear. I can’t wait to hear how you use your Three-In-One Pears. I’ll just wait here slurping them right out of a jar. This recipe requires a little time commitment, but you get three different products for your efforts. You'll find it was more than worth it when you crack open a jar of delicately ginger flavoured tender pears in a dark, caramel-scented ginger syrup, or drizzle some of the extra syrup over a bowl of vanilla ice cream or into a pear crisp, or sip on a glass of chilled pear juice. 4 1/2 cups raw sugar Can substitute light brown sugar if raw is unavailable. Prepare canner, jars and lids. Follow this link for more detailed instructions on how to do this. You will want 6-8 quart jars and 2-4 pint jars or 4-8 half pint jars and the lids/rings for them. Combine the raw sugar, sliced ginger and water in a large stainless steel saucepan. Stirring constantly to dissolve the sugar, bring the mixture to a boil over medium high heat. Add a lid to the pot, turn off the heat and leave on the burner to keep warm and infuse with the ginger flavour. This is the dark ginger syrup. Combine the juice ingredients in a stainless steel, plastic or glass bowl. Set this near a cutting board on the counter top. It is going to do double duty by preventing discoloration of the pears and then becoming juice. Remove the lid from the syrup and place it over medium low heat until steam is coming from it. Gently warm all but 12 of the pear halves in a single layer until heated all the way through. Use a slotted spoon to transfer the pears, cored side down in overlapped layers, leaving between 1/2-inch and 3/4-inch of head space (err on the side of more rather than less head space if necessary.) Be sure you've left 12 pear halves in the lemon water. Use a ladle to pour the hot syrup over the pears (allowing the ginger shreds to pour into the jars, too.) Remove air bubbles from the jars (using a thin, flexible knife or a chopstick and adjust syrup levels if necessary. Wipe rims, center lids on jars, and screw rings into place until fingertip tight. Pour additional syrup into pint or half pint jars leaving 1/4-inch of head space, wipe the rims, center the lids on the jars, and screw the rings in place until fingertip tight. Place those jars in the canner, cover with water, bring to a boil and process the jars for 25 minutes. When the time is up, turn the heat off, remove the lid from the canner and let the jars sit in the water for 5 minutes. Transfer the jars to a cooling rack and let them cool undisturbed overnight, then remove the rings, wipe down, label and store. Transfer the liquid and 12 remaining pear halves to a large stainless steel pot. Bring to a boil, lower the heat, and let simmer uncovered until the pears are falling apart. Line a colander that is positioned over a large stockpot with at least two layers of cheese cloth and and use a large measuring cup or ladle to scoop the pear/water mixture into the colander. Let it slowly filter -without pressing it down- until it stops dripping through the cheese cloth. This may take up to two hours. Place the stockpot over medium high heat and bring it up just to the point where steam is rising from the top- 190°F. Ladle the hot juice into prepared jars, leaving 1/4-inch of head space in the jar. Wipe the rims, center the lids, and screw the rings in place until fingertip tight. Place the jars in the canner, cover with water, add the lid to the canner and bring to a boil. Process for 10 minutes, turn off the heat, remove the lid from the canner and let the jars rest in the water for 5 minutes. Transfer the jars to a cooling rack and let cool undisturbed overnight. Remove the rings, wipe down and label and store. i have become so obsessed with ginger lately – i would be in heaven with these! that’s it. i’m coming to visit. Hi, I spent yesterday looking for your story on durian. I can’t find it and would love to read it again. They were talking about it on The Talk. I was telling everyone at work about your story and how funny it was. Can you help? Sounds yummy! We have asian pear trees. 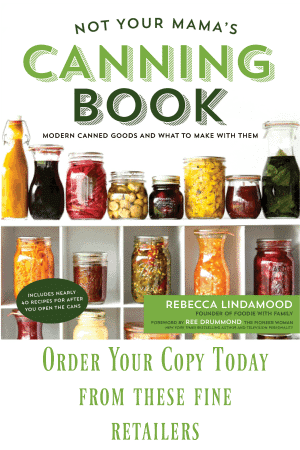 Have you ever tried canning those? If so how did that work out? And I’m so making some apple pie filling this week so I suppose you’ve inspired me to do two more things! Hi, there! I made the three-in-one pear recipes yesterday, and I love them all. I think this is such a smart recipe for so many reasons, and I’d like to link this page to my blog for next week, which is all about pears. Would that be okay with you? Cheers! You are welcome to include a link to this post. Thanks for asking, Jeanie! I’m so glad you made and enjoyed them! 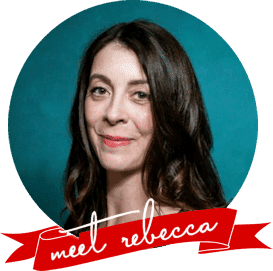 Thanks, Rebecca. The post will contain some information about how to make it four-in-one. I love recipes and techniques that squeeze all the goodness out of a fruit or vegetable. It should post on Sunday. This sounds like a great recipe!!!! I have plenty of pears to play with and oh so many recipes to try!! Great recipe! hi – pinned this recipe last year (after pear season) to try this out – looking forward to it. 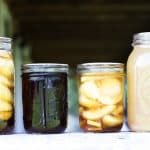 question about the jar sizes – pears and juice go in quarts, syrup goes in pints? I only ended up with 2-in-1 when it was all over but I used 12 lbs. of pears. There was no dark ginger syrup which really hurt because it is SOO good! Next time I cut back on the pears. Love this! I didn’t see a reply for the question about using Asian pears for your 3in1 recipe for pears? It sounds like a great recipe but I only have Asian pears and I know they differ from regular/European ones. Hi Connie- I’ve never canned Asian pears, but I imagine they’d behave pretty similarly! I would likely break them down into quarters rather than halves because of the shapes, though. I was finally able to try this recipe! I must say the ginger syrup is DIVINE! I did alter a couple of things as I had only 1 lb of pears, I saved the crushed pear and added in some of the syrup as a jam! And I reduced the syrup by a bit more than half, this made for a honey texture ! Thank you for your great directions, I love the recommendations on the jars as well! Thank you so much for your wonderful review, Shanie. Your alterations sound delicious!! This was terrible. Not the food itself the ginger syrup and pears are amazing however, the juice does not come close to keeping all the pears covered so I had to make 2 batches so my pears wouldn’t brown. You need an industrial sized bowl for this otherwise you are using every bowl you own. The ginger syrup only covered half of my jars so while I processed my first half of the jars I had to scramble to make a second batch which meant that I couldn’t let my first batch sit for 5 minutes with the fire off. While I do adore the recipe itself there needs to be some serious adjustments to the liquid portions of the recipe. Hi Lynessa- I’m not sure what happened there. Perhaps my peaches just gave off a lot more juice while sitting/simmering or maybe my peaches were smaller? I’m glad you like the flavour and the process, even if the quantities were a little tricky. I’ve made this several times, though, and I’m not sure where the issue is in the translation between my kitchen and yours. I am new to canning, so one quick question: In your directions, you say to ‘remove the rings’ after processing the jars. I don’t understand. I always leave the lids in place. If you remove the rings, won’t the lids just pop off? Hi Krysta- It seems counterintuitive, right? I promise, though, that this is sound advice. The ring is not actually what holds the lid to the jar; that’s the job of the vacuum you created when you were processing it and the sealing compound on the inside of the lid itself. The heat of processing penetrates to the center of your contents of your jar, kills any nasty bacteria or pathogens (theoretically- but more on this in a second), and softens the sealing compound on the inside of the jar lid. It also forces the air out of the jar as the contents expand and boil. Now, part two; when you take the jars out of the canner, lift straight up. Don’t tip the jars to let water run off of them. That little bit of water is part of the plan. You lift straight up and transfer the jars to the cooling rack where they’ll sit undisturbed for about 24 hours. While they cool (probably pretty soon after removal from the canner) you’ll start to hear them go “PING” which is the vacuum forming as they cool. This is also important for food preservation. The vacuum alone doesn’t do it, it just preserves whatever pathogen killing you did in the canning process and keeps it there. The water that was left on the top of the jars will run under the rings and down the jar as it cools. You’ll likely find water on the counter while this happens. Here’s where part 3 comes in. When the jars are completely cool and comfortable to handle (about 12 to 24 hours after removing from the canner), remove those rings. If you’ve processed them correctly, taking off the ring will not remove your lid. It’s stuck there courtesy of a combination of vacuum and sealing compound. But removing them does something important for your safety, too. If, by chance, some nasty thing was left in there during processing, it will create gasses as it grows and reproduces in the jar. This will break the seal of your jar which, in this case, is DESIRABLE! It’s what I call the Granny Car Alarm of Canning. If you go to remove that lid and it doesn’t make a “schlooop” sound or lifts easily, don’t eat it.